You are here: Home / Places / Hoyle Road Staff: Recognise anyone? Hoyle Road Staff: Recognise anyone? Alan Smith wonders how many former Hoyle Road staff you can recognise in the above photo? Alan says that the photo was taken in 1953 at the playing fields in Melrose Avenue. 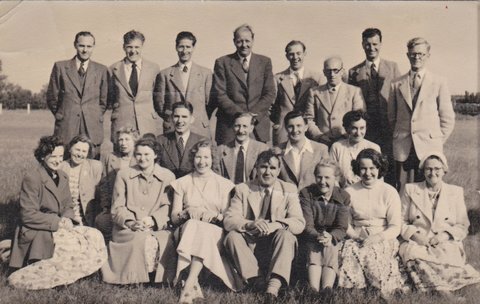 Certainly recognise Mr Rigby Headmaster (centre front row) and just behind him in the tie is Mr Biggin ,woodwork teacher (infamous for his cane called ‘pip-squeak). I left the Parade in 1963 so some of these staff may not have been there . Would be interested to see if anyone else remembers anymore. Mr Boyd, Mrs moulding, Miss Leeming, and Mr Sefton detested him! Most of the rest I had in many varied subjects, some alright others awful. But really good to see them all together. Does anybody remember or no what became of Miss (Mrs) Beaver, she was one of the nicest of people and a fine teacher? No, But I know Miss Devereux is still going strong or was a few weeks ago, she lives at the beginning of Meols Drive, still immaculate bless her. Does anybody remember or know what became of Miss (Mrs) Beaver, she was one of the nicest of people and a fine teacher? When we did the Parade Reunions in both 1999 and 2003 we tried to find Mrs Beaver and eventually found out that she was living in Lincolnshire and wasn’t in particularly good health. Apparently she had been widowed for several years and hadn’t been back to the Wirral for a long time. She was my form teacher in 2A. Hello Pat, of course I remember you in 2A. I was particularly fond of Mrs Beaver, she was a kind and gentle soul although she brooked no nonsense. my email address is bermarg@rogers.com if you drop me a line maybe we could catch up on the intervening years. I have been living in Canada for 40 years this year so it would be nice to hear how old friends made out. Also Pat didn’t you sit next to Janet Rudge? Brought back many memories, not sure if that is Bernard Sefton. But would leave it to those who know better. If I remember poor Miss Jackson was cross eyed, perhaps not a PC thing to say today. The problem was you never really knew when she was looking at you. Jack Roberts had a fearful ruler, which I felt on a number of occasions ah well happy days. My Dad Fred Birtall (at the school 1941 – 1944) remembers Mr Clem Morgan having a false eye, which he used to leave on his desk at the front of the class when he left the room, to keep an ‘eye’ on students. Dad says they were always very good! Mrs. Beaver was a delightful person and expected the highest standards from us in English classes, and treated everyone with the greatest courtesy and respect. I left the Parade school after the second year and went to boarding school at Loreto College in Llandudno. Mrs. Beaver arrived one day with her husband and brought me a cake. They were not allowed to take me out for the afternoon and she was very unhappy and objected to this stifling regime at the convent. She was right. I was sorry she was unable to come to the 2003 reunion, organised by Pat Ireland. Hello Pamela – its been a few years but nice to know you are remembered. All the Parade reunions were great nights with so many people able to catch up with “long lost” friends. Mrs Beaver was my Form Teacher in 2a – always remember her as being very smart and never without being fully made up ( with the lipstick a bit heavy at times). The teacher I remember most, although not in the picture I dont think, was Norman Kendrick. I have never forgotton the fact that he called me and my friend “cardboard kids” because we were both quite shy and didnt have the courage to put our hands up to answer questions. A good teacher would have tried to boost our confidence instead of putting us down in such a way. Sorry Pat Ireland I see you have recognised Norman Kendrick on the back row. I didnt recognise him ! Brian, Mr Boyd was my form teacher until I left school in 1953, he was a stretcher bearer with the medical corp during the war carrying the injured off the battlefield, he was also the arts & crafts teacher, he chose 3 of us to plan and build a bungalow in the classroom, he made arrangements to take us to Barker&Dobson brickworks in moreton to have little bricks made approx 6cm long and have them fired in the kilns along with the real bricks, we then made the little window frames during the woodwork lessons, we got the bungalow built as far as the roof but we couldn’t finish it because we all left school in 1953, I often wonder whether it was ever finished or not. Anyone that can remember West Kirby RAF camp will remember the aircraft that stood just inside the main gateway, was it a Spitfire or a Hurricane. Spitfire AR614 from 1952 – 1958 – subsequently rebuilt, and I believe now at Duxford. There was also a Meteor – a photo shows it there in 1957.